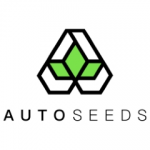 Auto Seeds - Gorilla Glue Auto. Free US delivery. Gorilla Glue Auto is an indica-dominant strain that was created by crossing a Gorilla Glue with Auto #1. This is one very sticky strain and is very aptly named. A medium-sized plant at 65 - 100 cm. tall. Some phenos of the original photoperiod plant produced 30% THC and this auto version still reaches 23%! Astoundingly, given it sheer quality, this is a very easy strain to grow whether indoors or outdoors. In as little as 65 days it can deliver more than 600 gr/m2 with a minimum of 600 watts of lighting and 10 plants per light. It is a very forgiving plant that withstands changes in temperature, acidity levels (ph), nutrients and moisture although it should be noted that the very best results will be achieved when slightly increased levels of nutrients are given and even some added CO2. Life-cycle is 70 - 75 days from germination. Gorilla Glue Auto has a flavour that mixes citrus, pine, coffee and earthy notes. The effect is of a very potent body stone that really can have smokers "glued" to the couch. It is a therapeutic strain par excellence which is helpful for those suffering from the symptoms of chronic pain, depression, nausea and muscle spasms.